Thanks to everyone who participated in the 500 for the 50th Goods Drive. Together with the College of Arts and Sciences and the College of Fine and Applied Arts, we collected 766 items for Appalachian’s campus food pantry and free store, located in the Office of Sustainability. We surpassed our goal of collecting at least 500 personal care and/or food items by 266! 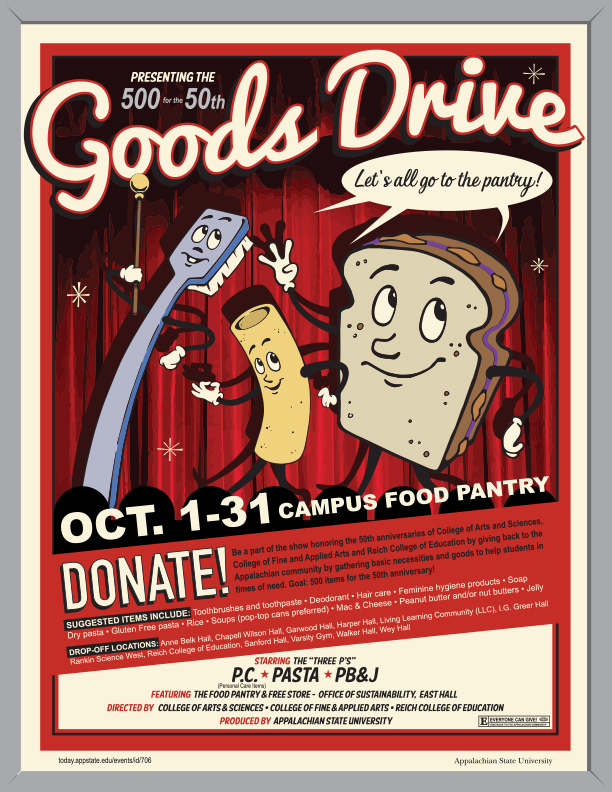 In honor of their 50th anniversaries, the College of Arts and Sciences, College of Fine and Applied Arts and Reich College of Education at Appalachian State University will host a goods drive focused on the “3 P’s” — personal care items, pasta, and peanut butter and jelly/jams — for Appalachian’s campus food pantry and free store, located in the Office of Sustainability.